And the memory of the night we spent together. Searching through a neighbor’s trash can. Und die Erinnerung an die gemeinsam verbrachte Nacht. Beim Durchstöbern der Mülltonne eines Nachbarn. И в памяти та ночь, которую мы провели вдвоём. Ve birlikte geçirdiğimiz gecenin anısı. Zincirinden kurtulmuş bir köpeğin görünüşü. E a lembrança da noite que passámos juntos. A revirar a lata do lixo de um vizinho. Charles Simic (born in Belgrade in 1938) emigrated with his family from Yugoslavia to Chicago in 1953. He became a major American poet who, as he says himself, writes and dreams in a language he speaks with an accent. His work has earned awards such as the 2005 Griffin Poetry Prize (for his Selected Poems 1963-2003, 2004) and the Pulitzer Prize. In 2007 he was named as the 15th Poet Laureate Consultant in Poetry to the Library of Congress of the USA. 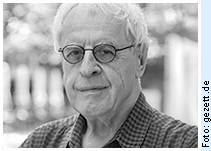 In his work, Charles Simic amalgamates various influences from American greats such as Emily Dickinson, Hart Crane and Theodore Roethke to nonsense verse, children’s verse and riddles to the Serb poets Ivan V. Lalić and Vasko Popa, whom he has translated into American. His poems are profound structures soaked in myth; but - “No myth without a funny bone.” The texts are full of cockroaches with fake identity papers and ants with Quaker hats. Buster Keaton meets Thomas of Aquinas, and Dostoevsky works as a bouncer in a murky nightclub. Simic is also a master of the small, everyday things in poems about coat-hangers, shoes, knives, lost gloves and keys.